Archery is fun and if you want it to it can be competitive as well. To get you off to a good start we have put together our beginner’s course. you will be shooting during your very first session. All aspects of shooting and equipment are covered. Safety aspects will be covered in detail. On completion of the course, you can become a full member of the club. We have a thriving club of all ages and abilities. Once a full member, you can choose to shoot for recreational purposes or go on to enter tournaments. Field shooting is also a possibility when and where the club has access to woodland. The course fee is £40.00 and runs over five weeks. Each session is approximately one Hour. Outdoors during the Summer, indoors during the winter. booking essential. Our experienced coaches will get you shooting on the first evening and gradually increase your knowledge and skill over the next five weeks and you will graduate with a certificate and be offered club membership. 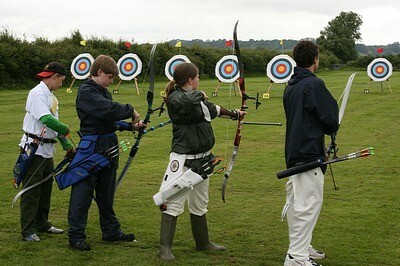 To book your place on the Archery Beginners Course please complete the form below. Should you have any questions before booking please contact us. If the archer is under 18 please complete as Parent/Guardian. Are there any health issues we should be aware of, please specify. We will always try to accommodate your course date preference but in the event that we are oversubscribed we will notify you of the next available date. *Note: Your first quarters’ shooting fee is included however your membership fee is payable to join.